In October 2009, Chrystie Hill spoke at TEDx - Columbus expressing in a personal way her vision for libraries. 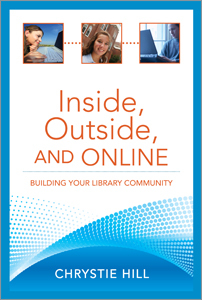 As she notes, in researching for her book Inside, Outside, and Online, she spoke with library staff, thinking about their practice through a community-building lens. Across the board, she heard that librarianship is about people and connections, not the books or the services that we think people need. Tim O’Reilly, in presenting his ideas of Government 2.0 in an Inc. article, said, “We've come to think about government as a kind of vending machine -- we put in our taxes and we get out services." He suggested that we look at government as a platform, like Apple’s iPhone, upon which 150,000 apps have been created, harnessing the entrepreneurial energy of others. What then would be the role of public libraries? Digitized music, movies, and ebooks challenge libraries’ function as a “vending machine” of physical items. Perhaps libraries’ platform is the human connection that Chrystie describes in this 20-minute video. Chrystie Hill said that she was mad that she didn’t bring a copy of her book to the Tedx talk.. “They didn’t tell me I could.” We’ll do better. Below is an excerpt. As a library professional, I value traditional library services and am as interested as most of my colleagues in whether library visits and overall circulation have increased. Yet, increased circulation and visits to the library, even an increase in library program or classroom attendance (especially for children’s programs), feels less of a feat against the fact that we’re not doing a good job online or outside the library. We’re absent (not entirely, but mostly) as active community builders even in our own spaces, but certainly outside the library. We’ve neglected to recognize our role as organizers and keepers of information access as primarily a social role. In fact, the scholars engaged in early discussions about the role of the library in developing and facilitating the participatory and social nature of the Web weren’t librarians, and the year was 1996. In their seminal work “The Social Life of Documents,” John Seely Brown and Paul Duguid explained that documents—digital or otherwise—are much more than carriers of information. Although documents are powerful for helping us structure and organize information space, they also help us create and negotiate social space. In other words, groups form and conversations emerge around them. Brown and Duguid argued that we should expand our notion of the document to include all the social interaction that happens around it. Here they are in the late 1990s, well before Web 2.0 or prevalent Internet use, telling us that if we pay attention to how people form groups and create community around documents, it will help us move technology (and by extension, other ser¬vices) in the direction of what humans actually do with a document (Brown and Duguid 1996, 2000). In my version of the story of where we went wrong, my first point is this: we’ve neglected to consider, in general, the social life of documents, as outlined in the article. This is true for all documents, regardless of format. Trudee is a young professional, presently in her early twenties. She won’t ask a librarian any question, at any time, for any reason. I can ask my friends or find it myself, she says on the suggestion that she ask a reference librarian to help her solve a problem or locate information; they’re faster. Matt is a middle manager, presently in his early thirties, who also trained as a librarian. Upon discussing whether his local library is relevant to him, he says (quite emphatically), the most important information need that I have is “what are my friends doing?” concluding then that the public library is not relevant to him as an individual user. In the words of one OCLC survey respondent, presently in her early forties: Books, books, books, rows and rows of books, stacks of books, tables filled with books, people holding books, people checking out books. Libraries are all about books. That is what I think and that is what I will always think. Somewhere along the way we chose (deliberately or otherwise) to value our traditional roles as much as we valued the traditional definition of the documents we cared for. If documents helped humans structure and organize information space, librarians helped humans structure, organize, and access documents. In neglecting the social nature of documents and our users, we neglected to nurture, or at least to articulate, the very social nature of our own roles. “For what Hill (director of community services, WebJunction) offers is nothing less than a holistic vision for public libraries in the United States, centered on the library's ability to create community. She adroitly draws on scholarship and research, examples and interviews, to create a plan for libraries that is as sharply focused as it is quietly urgent.” Library Journal, starred review. See the Google books excerpt.